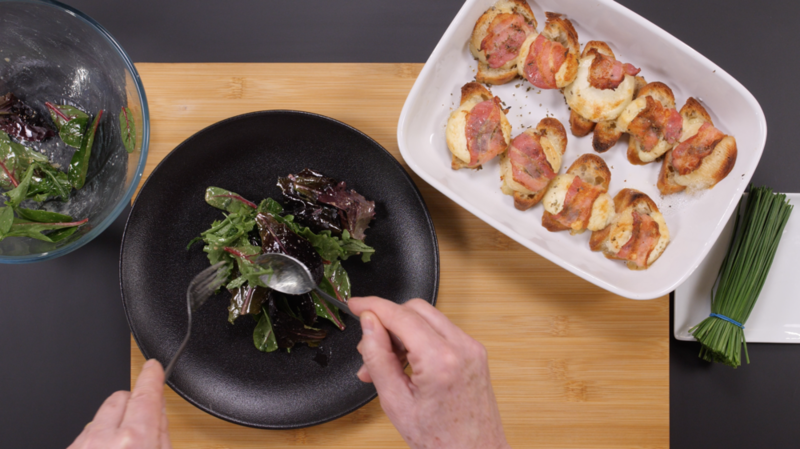 In Part 1 of French Cuisine Foundation Level you will learn fundamental techniques that will help build your professional chef skills. Unit 1 covers a number of important knife techniques that when mastered will truly impact your cooking skills. Unit 2 introduces fundamental stocks and sauces and how they are used in soups and other classic French recipes. The bouquet garni is an essential part of French Cuisine. French for "garnished bouquet" it is a bundle of herbs usually tied together with string and used to prepare soups, stocks, casseroles and various stews such as Boeuf Bourguignon, Cassoulet, and Coq au Vin. It is readily available in French supermarkets but can be difficult to find outside of France. The bouquet is cooked with the other ingredients to add flavor, but is removed prior to serving. Clarified butter is butter from which all milk solids have been removed. When the milk proteins and water are removed, what is left is almost 100% pure butterfat. Clarified butter is used a lot in French cooking. It is a must in sauces like Hollandaise and Béarnaise. The technique calls for a bain-marie which is used for cooking delicate foods like custards and terrines and melting chocolate as it creates a gentle and uniform heat around the food and prevents it from burning. Knife skills are one of the most important things you will learn as a culinary student and having good knife skills is a requirement if you want to succeed as a chef. There are many different types of cuts and it is important that you know and understand them. In this lesson you will learn three of the essential knife techniques: Ciseler or chop finely, Emincer or slice and Hacher or mince. In this lesson you will learn two of the essential knife techniques: Paysanne and Mirepoix. A “Mirepoix” is a classic French combination of vegetables which adds flavor to a dish. It is a combination of onions, celery and carrots. In this lesson you will learn two more essential knife techniques: Julienne and Brunoise. Julienne is also sometimes referred to as allumette, or french cut. For Julienne the vegetables are cut into long thin strips, similar to matchsticks. Common items to be julienned are carrots, celery and potatoes. Turning vegetables is a technique used in classic French Cuisine. Vegetables are turned in order to form the exact same shape and size which ensures even cooking and an aesthetic presentation. Artichokes are a member of the thistle family, some varieties even have sharp little thorns on the tip of each leaf. 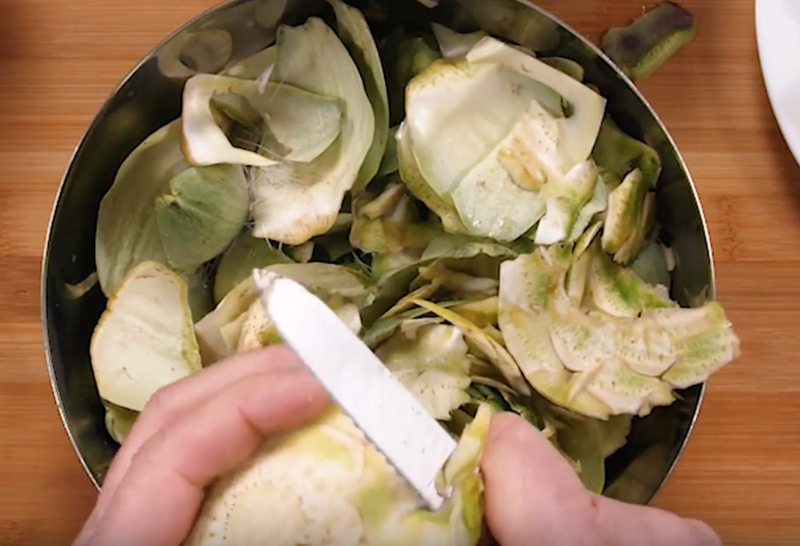 Artichoke choke is the furry, thorny, central core. The bottom of the artichoke is the edible portion including the base, some of the stem, and sometimes some of the inner leaves. A fish fillet, from the French word filet meaning a thread or strip, is the flesh of a fish which has been cut or sliced away from the bone by cutting lengthwise along one side of the fish parallel to the backbone. The skin present on one side may or may not be stripped from the fillet. As opposed to whole fish or fish steaks, fillets do not contain the fish's backbone. Fish stock (fumet in French) forms the basis of many dishes such as fish soups and sauces. It adds a depth of flavor to many seafood dishes. Fish stock is made by gently simmering bones with vegetables and herbs. In the case of fish stock, the bones typically include the heads, spines, ribs, and tails of mild, non-oily, white-fleshed fish to achieve a delicate fresh flavor. This is a classic French Fish soup recipe that you will find in many regions in France. Different types of white fish can be used. Pot-au-feu (meaning pot on the fire) is a classic French beef stew that goes back centuries, probably originating about the time of the French revolution in 1789. The chef Raymond Blanc said that it is "the quintessence of French family cuisine, it is the most celebrated dish in France. It honors the tables of the rich and poor alike”. Often served as a soup or starter, the stock is rich and delicious. A consommé is made by adding a mixture of ground meats, together with vegetables tomatoes, and egg whites into either bouillon or stock. The act of simmering, combined with frequent stirring, brings impurities to the surface of the liquid, which are further drawn out due to the presence of acid from the tomatoes. Eventually, the solids begin to congeal at the surface of the liquid, forming a 'raft', which is caused by the proteins in the egg whites. The final consommé is a clear liquid that is passed again through a filter to ensure its purity. Stocks form the basis of many dishes, particularly soups and sauces. Making stocks involves simmering animal bones or meat, seafood, or vegetables in water or wine, adding mirepoix or other aromatics for more flavor. Reduced poultry stock is an intensely flavored stock that can be used in many dishes. Pumpkin soup is eaten all over the world. It is the Independence Day dish for the country of Haiti, was served to prisoners of war in North Vietnam during the Vietnam War, and is popular in the US at Thanksgiving. It is a delicious seasonal soup for fall using bouillon pot-au-feu. 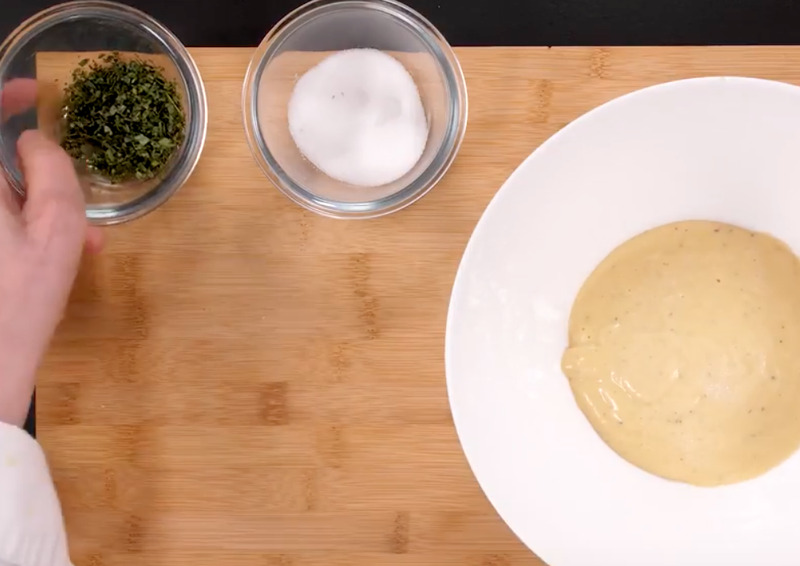 Béarnaise sauce is a sauce made of clarified butter emulsified in egg yolks and white wine vinegar and flavored with herbs. The sauce was likely first created by the chef Collinet, the inventor of puffed potatoes (pommes de terre soufflées), and served at the 1836 opening of Le Pavillon Henri IV, a restaurant at Saint-Germain-en-Laye, not far from Paris. Fish with Bercy sauce is another classic French recipe. Bercy sauce, named after a district in the east of Paris, is a finished sauce for fish and seafood dishes made by reducing white wine and chopped shallots and then simmering with fish stock. 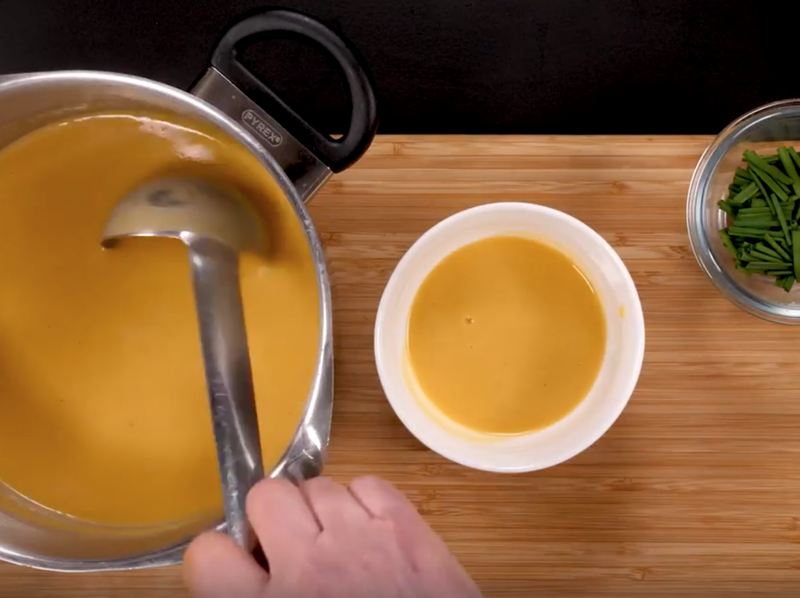 Potage Cultivateur – literally Farmer’s Soup - is another great classic recipe in French Cuisine and is the perfect soup to practice and use your Paysanne cut knife technique. The soup has a clean, fresh taste with a nice depth of flavor added by the bacon. Soupe à l’Oignon or onion soup has been known as far back as Roman times. Onions were easy to grow and readily available. This classic version of the soup originated in Paris, France in the 18th century, and is made with pot-au-feu stock, and caramelized onions. In Part 2 of French Cuisine Foundation Level you will learn more techniques to build your professional chef skills. More essential sauces will be introduced such as Béchamel, Hollandaise, Verte and Tartare and then used in recipes. We will also cover frying, grilling, roasting, sautéing and more while making some delicious French dishes. Béchamel Sauce is one of the “Mother Sauces” in French cuisine from which all other sauces are derived. It is made from a roux of flour, milk and butter and is also known simply as white sauce. It is an important base for many other sauces and also for soufflés. Its origins are likely from Tuscany, Italy where it was known as "Salsa Colla or Colletta" ("glue sauce") because of the gluey consistency. A soufflé is a baked egg-based dish which originated in early eighteenth century France. The word soufflé is the past participle of the French verb souffler which means "to puff" reflecting the puffed texture of the final dish. It was perfected in the mid-1800s by Marie-Antoine Carême who, in cooking for the newly rich in Paris, was aided by updated ovens that were heated by air drafts rather than coal. This change was key to the rise of the soufflé. Gnocchis à la Parisienne are made with pâte à choux, not with potato like the Italian gnocchi you may be more familiar with. The texture of the Parisienne gnocchi is much lighter and airier than potato gnocchi. The recipe also uses Béchamel sauce and the gnocchi are baked at the end topped with ham and cheese. Gratin dauphinois is a French dish of sliced potatoes baked in milk. This dish was traditionally eaten by the peasants in the Dauphiné region which is a mountaineous region around Grenoble. It is a true French classic with the first mention of the dish being from 1788. Seldom seen outside France, warm goat cheese salad or salade au chèvre chaud is a common and delicious item on French menus. It is composed of mixed greens, vinaigrette, and chèvre broiled on French bread. Filleting a Sole is a different technique from other fish as it is a flatfish. Flatfish include plaice, sole, turbot, halibut and brill. Here you will learn this technique in preparation for the next recipe: Sole Meunière. 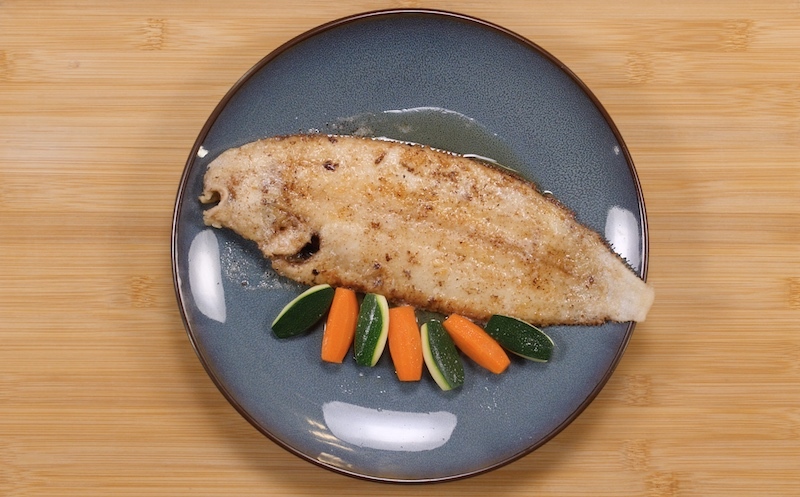 Sole meunière is a classic French fish dish consisting of sole dipped in flour, then pan fried in butter and served with the resulting brown butter sauce, parsley and lemon. Meunière is both the sauce and the method of preparation. The word literally means "miller's wife". Green Sauce or Sauce Verte is another classic French sauce made with plenty of fresh herbs that goes back as far as the renaissance. Sauce Tartare is a mayonnaise based sauce that has been found in cookbooks since the 19th century. It is named after the Tatars from the Eurasian Steppe and is used frequently with seafood dishes. This lesson begins the introduction of different frying methods and uses the Sauce Verte and the Sole from previous lessons. Another method of frying is introduced in this lesson with delicious crunchy fried King Prawns (Beignets de Gambas) and the Sauce Tartare from previous lessons. Sole Filets with Dugléré Sauce is another flat fish dish using a white wine sauce which is named after the chef Duglére. This dish, originally using Brill, was created over 150 years ago while Dugléré was the executive chef, at the legendary Café Anglais, Paris and is still on many menus today. 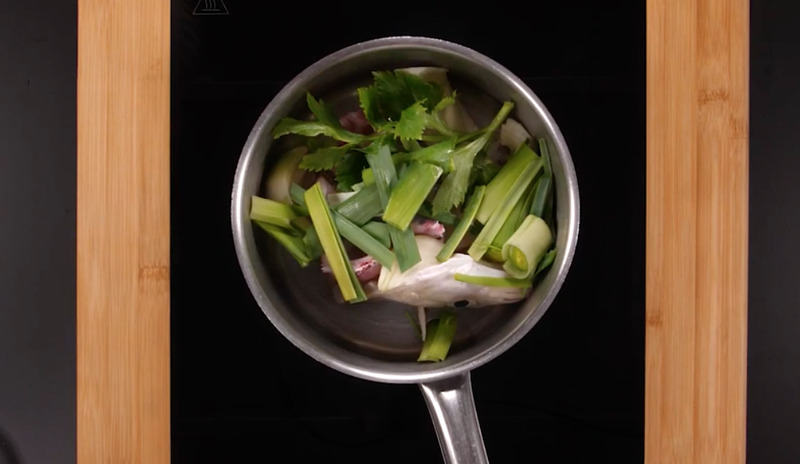 The braising method is covered in this lesson. 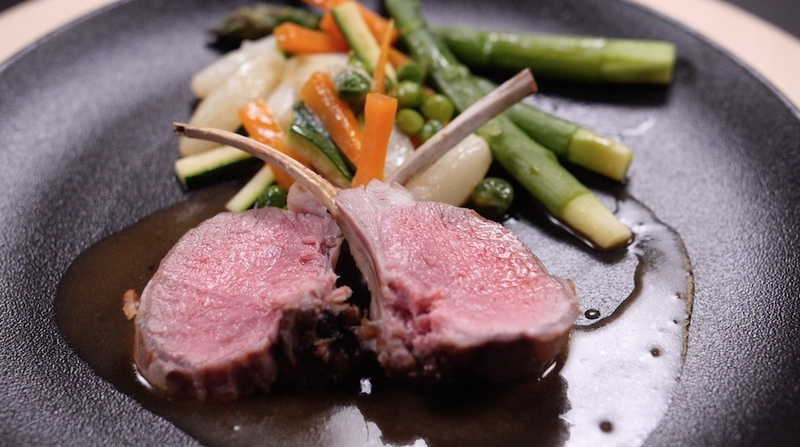 Lamb chops with glazed vegetables is another classic French dish and introduces the technique of glazing vegetables as well as sautéing. Hollandaise sauce is served either alongside or as part of many dishes that include vegetables, fish and egg dishes both hot and cold. It is one of the five mother sauces in French cuisine alongside Béchamel, Velouté, Espagnole and Sauce Tomat . A mother sauce means that the sauce’s basic recipe may be used to create other sauces. Foie Gras is fattened goose or duck liver. It has been considered an important French gastronomic experience for hundreds of years and part of France’s cultural history. Foie gras Poêlé is lightly seared. Learn how to cook a filet of beef to perfection. The different levels of “doneness” and how to be sure that your filet is cooked as you want it to be.